Though the offseason still has a few days remaining before pitchers and catchers descend on Florida and Arizona, most teams have already completed the majority of their winter shopping. Save a couple of key free agents who are still searching for work, rosters have been shaped for what should be an interesting season in the National League East. In 2012, the Washington Nationals announced their arrival with a division title. The Atlanta Braves waved goodbye to franchise icon Chipper Jones after a disappointing Wild Card loss, while the perennial powerhouse Philadelphia Phillies were beset by injuries. It was a frustrating season for the New York Mets, who fizzled in the second half. Down in Miami, the Marlins underwent a baffling and well chronicled identity crisis of epic proportions. 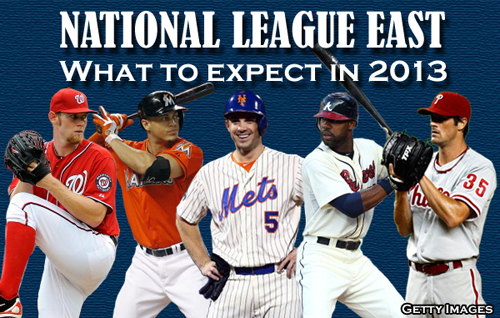 While the balance of power may not be shifting all that much, it is time to look at what to expect from the NL East in 2013. The Braves went into the winter on the most disappointing of notes. A Wild Card loss to the St. Louis Cardinals stung on multiple levels, and put a halt to Chipper Jones’ magical retirement tour. GM Frank Wren did not spend his time dwelling on losses, and instead has positioned his club for big 2013 season thanks to an offseason packed with major moves. Offseason Grade (A): Signed B.J. Upton. Traded Martin Prado and prospects for Justin Upton. Traded Tommy Hanson for Jordan Walden. Exercised team options on Tim Hudson, Paul Maholm and Brian McCann. Re-signed Reed Johnson. Signed Gerald Laird. Non-tendered Jair Jurrjens and Peter Moylan. What they have: The Braves have a starting rotation that contains the grit and guile of proven veterans the pure stuff and potential of youthful hurlers. Hudson is the most battle tested, while Kris Medlen and Mike Minor flash the most promise. Maholm should capably hold down the fourth spot in the rotation, but top prospect Julio Teheran needs to return to his pre-2012 form at the back end. Brandon Beachy should be returning around the All-Star break from Tommy John surgery as well. Walden, an All-Star for the Angels in 2011, joins the trinity of Eric O’Flaherty, Jonny Venters and Craig Kimbrel to establish an incredible bullpen. On the offensive side of things, Atlanta’s lineup is much more righty-lefty balanced than in years past with plenty of run producing potential. However, for all the power they boast, Braves hitters will rack up quite a few strikeouts this season. What they need: Big production from the young and talented outfield is an absolute must. B.J. and Justin Upton did not come cheap, and will be expected to play at a high level on both sides of the ball. Their contributions will complement the play of Jason Heyward, while all three men seek to prove themselves as the best outfield in the game. Atlanta also needs steady results from the third base position with Jones’ retirement and Prado’s departure. That will be tasked to Chris Johnson and Juan Francisco. A healthy McCann and a resurgent Dan Uggla could make this the most powerful lineup in the National League. But this game is not played on paper. What to expect (2nd Place): The power potential of the lineup is off the charts. The rotation is strong, and the bullpen is stronger still. Atlanta won 94 games last season and has taken considerable steps to get better. If any team in the division has the pieces to unseat the Nationals, it is the Braves. The Marlins are a study in what not to do with the public image of a sports team. They completely threw in the towel on contending for the division crown not even one year after spending big money on player acquisitions and a new stadium. That being said, they have managed to stockpile an impressive amount of young, talented and controllable players for the foreseeable future. The jury remains out. Offseason Grade (C+): It is not as simple as a letter grade with the Marlins, because nothing is simple with this team. Only time will tell when assessing the long term return from all the trades. Traded Jose Reyes, Josh Johnson, Mark Buehrle, Emilio Bonifacio and John Buck to Toronto. Traded Heath Bell to Arizona. Traded Yunel Escobar to Tampa Bay. Fired manager Ozzie Guillen. Miami hired Mike Redmond as its new manager. To fill the numerous player voids, the Marlins opted to sign a slew of veteran players to short term or minor league deals. Those include pitchers Jon Rauch, Chad Qualls, John Maine, and Kevin Slowey, outfielders Juan Pierre and Austin Kearns, as well as infielders Placido Polanco, Kevin Kouzmanoff and utility man Chone Figgins. What they have: Miami held onto homegrown slugger Giancarlo Stanton, while it compiled a fascinating stock portfolio of young talent. As a manager, Redmond is a sharp baseball mind who has been working with young players in the Toronto system and will be a stark departure from Guillen. A crowded camp gives Remond more than a few options to choose from as the Marlins attempt to put the pieces back together following a chaotic 2012 season. What they need: The Marlins could definitely benefit from some veteran reinforcements for the rotation and the bullpen. Some of the players signed over the winter could fit the bill, but many of them are on the comeback trail or simply far removed from their prime. There are plenty of prospects gleaned from other organizations through multiple trades. Some will break camp with the Marlins, while others are knocking on the door. The Marlins also have several high ceiling prospects ascending through the system. Among those are outfielder Christian Yelich and pitcher Jose Fernandez. What to expect (5th Place): It is doubtful that this season’s Marlins will do much more in the win column than their 2012 predecessors. The unexpected rebuilding process will create challenges for the club when it comes to drawing crowds to its state of the art ballpark as well. However, the youth movement from all the trades made over the past eight months could bear some fruit this year. The 2012 Mets were trending in the right direction over the first three months, but a July collapse pushed them from a first place tie on June 3, to 24 games out by year’s end. R.A. Dickey’s Cy Young campaign, Johan Santana’s no-hitter, a healthy season from David Wright, and the debut of fireballer Matt Harvey were about the only highlights. They now find themselves in the midst of a rebuilding process. Offseason Grade (B): Traded R.A. Dickey to Toronto. Released Jason Bay. Extended David Wright. Signed Shaun Marcum, Brandon Lyon, Scott Atchison, LaTroy Hawkins, and Pedro Feliciano. What they have: Wright is now cemented as the face of the franchise after signing an eight-year extension. Even without Dickey, the starting rotation should still be a strength. Jon Niese is coming off a very respectable season. Add recently signed Marcum to Santana and Dillon Gee, then slot those arms in front of Harvey and New York has a nice starting five. Top prospect Zack Wheeler is also fast approaching, so there are reasons to be excited about the pitching staff. The offense is a different story, however. Wright and Ike Davis will provide some power at the infield corners, while the double play combo of Daniel Murphy and Ruben Tejada handle the bats relatively well. GM Sandy Alderson cobbled together what should be a serviceable bullpen. What they need: There are several areas that could use marked improvement, none bigger than the outfield. The Mets appear to be stuck in neutral with Michael Bourn since they are in no hurry to sacrifice the #11 pick in this June’s draft. Any way you slice it, more production is needed from the outfield. Additionally, Davis needs to step forward as a true middle of the order threat. He started very slowly but ended the season with 32 home runs and 90 RBI’s thanks to a stronger second half. New York believes Davis is capable of more. Stud catcher Travis D’ Arnaud was the big haul from Toronto in the Dickey trade and is a major piece of the puzzle. He could make the team with a strong showing this spring. Meanwhile, the oft-injured Santana threw the first no-hitter in franchise history on June 1, 2012, but did not seem to be the same after that. Though he may not be a true ace-type pitcher anymore, he could still be a 15-game winner in the big leagues if healthy. What to expect (4th Place): There’s very little chance that the Mets will be contending for even a Wild Card spot this season, but the future is looking brighter. Call it a combination of age and injury, but whatever it was did no favors to the Phillies last year. Losing key pieces in the lineup and pitching staff kept the club from ever enjoying any kind of consistent success. Philadelphia found themselves doing some selling at the trade deadline last season, and questions remain heading into the 2013 campaign. Offseason Grade (C+): Traded for Michael Young. Traded for Ben Revere. Signed Delmon Young, John Lannan and Mike Adams. What they have: This is a team comprised largely of proven winners. Jimmy Rollins, Chase Utley and Ryan Howard remain the core offensive pieces, while the rotation boasts Roy Halladay, Cliff Lee and Cole Hamels. Closer Jonathan Papelbon had his fair share of success in Boston before signing with Philadelphia prior to 2012. Trading for Michael Young gives Philadelphia a player who brings consistency at the plate and versatility in the field, though he will start at third base. Getting center fielder Ben Revere from Minnesota brings speed, defense and a top of the order type bat to offset last season’s trade of Shane Victorino. What they need: Health is the key for the Phillies. In order to compete, Utley and Howard have to be in the lineup on a regular basis, and Halladay must be taking his turn every fifth day. The corner outfield spots are anything but certain. Philadelphia signed Delmon Young, and hope that he can be a full season regular in right field for the first time since 2007. Offseason ankle surgery could delay his season debut, however. A long awaited step forward by Dominic Brown would go a long way toward alleviating at least some of the problem. John Mayberry Jr. and Darin Ruf could see some time in the outfield as well. Even though Michael Young has established a reputation as a professional hitter, Philadelphia needs him to bounce back to pre-2012 form. Last year with Texas, Young collected his fewest hits and RBI’s in a season since 2002, and set a career-low with only eight home runs. What to expect (3rd Place): Philadelphia’s 2012 woes were due in large part to injury. Even with Hamels, Lee and Halladay all pitching well, there are still quite a few lineup and run production questions that must be addressed. This group could get back around or above .500, but bypassing Washington and Atlanta to win the division and/or a wild card spot is a stretch. The Nationals spent recent years building their team in hopes of jumping into the mix. Player development was key, but utilizing the free agent market effectively was of the utmost importance. Instead of simply dipping their toe in the pool, Washington went ahead and bought the entire property. Now they are set up to swim with the big fish in all of baseball for years to come. Offseason Grade (A): Traded for Denard Span. Signed Dan Haren and Rafael Soriano. Re-signed Adam LaRoche. Traded Michael Morse to Seattle. What they have: This is a talented team that seems destined for great things. The rotation of Stephen Strasburg, Gio Gonzalez, Jordan Zimmerman, Haren and Ross Detwiler will provide the foundation for contention. Signing Soriano to close games made the bullpen even better. The lineup has a balance of speed and power that is perhaps best exemplified by Bryce Harper, Ian Desmond, and to a lesser extent, Danny Espinosa. The veteran presence of Ryan Zimmerman, Adam LaRoche, Jayson Werth, Denard Span and Kurt Suzuki rounds out a batting order which should provide plenty of runs this season. Manager Davey Johnson is going to have an extremely talented team to defend the division title, but repeating is generally the tricky part. What they need: It may be as simple as having a full season of Strasburg to put Washington deep into October. Shutting him down for the stretch run and playoffs in 2012 did not stop the club from clinching the East, but there is no doubt it impacted the team’s ability to advance beyond the NLDS. The postseason is the time of year when a team depends on its staff ace more than ever. A bullpen which was strong last year was made even better when Soriano signed over the winter, but the Nationals are counting on seeing the dominant Soriano who was a late inning force in 2010 and 2012 rather than the somewhat listless 2011 version. Though Washington does have some very capable closing candidates in house if he falters, the move to bring in Soriano was designed to make the late innings a steep task for opposing hitters. It was also a decision that did not come cheap. What to expect (1st Place): Another good season in the Nation’s capitol seems to be in the making. The strength of pitching and talented lineup should allow Washington to maintain its status as the team to beat in the East.